Inside view: The great halls of China | What Car? If you want to see how buying power is shifting in the world of cars these days, go to a motor show. Even better, go to two or three. There used to be a clearly defined structure as to how exhibition budgets were spent. Every manufacturer would do Detroit in January because it was on the American motor industry's doorstep, Geneva in March because it was on neutral ground, the alternating Paris and Frankfurt shows in September to preen in front of cosmopolitan European buyers, and Tokyo every other October to try to show the Japanese who was top dog. Then the recession came along and, without exception, everyone began examining the value they get from these seven-figure jaunts. There were big gaps at Detroit this year even some of the Japanese companies that build cars in the US were absent. Others will be AWOL at Frankfurt. Many European and American companies will skip Tokyo. At Shanghai earlier this week, however, it was all hands to the pumps at least as far as the companies that trade in and with China were concerned. There were nine halls crammed with cars, including a number of world debuts and not just from Chinese manufacturers you may have never heard of. The reason is simple. 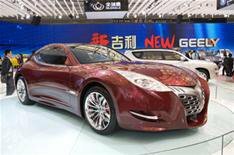 The Chinese car market, unlike most, is still experiencing growth sluggish growth, maybe, but China has now surpassed America to become number one in the world. Forecasters are expecting auto sales to top 10 million this year. China is also ahead of anywhere else for sales of luxury cars. No wonder Porsche, Mercedes-Benz and BMW all showed new or updated limos, and Jaguar turned up with a 20-second teaser video for the next XJ. Wandering around the place, you didn't get the feeling the Chinese are going to come over and conquer Western Europe any time soon domestic manufacturers still have their hands full trying to satisfy the home market, it seems, and to be honest there isn't yet that much that would appeal to our more sophisticated tastes. Shanghai Auto, which bought out MG Rover, is on the right lines; there are possibilities at Brilliance; and Hong Kong-based Geely shows pockets of promise. The rest, frankly, wouldn't stand a chance. No, it was more a question of whether some European and US manufacturers are going to have to change in future to please buyers in what is now their most important market.